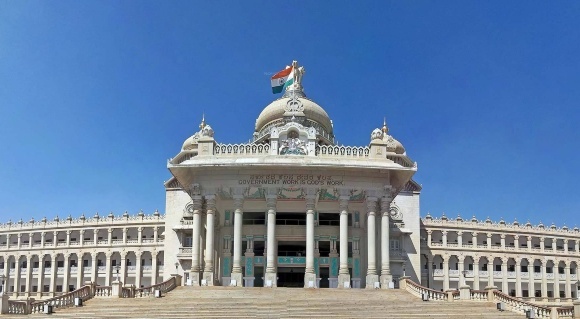 A record number of 2,407 candidates have filed nominations for the May 12 Karnataka assembly elections, with a whopping 1,280 of them doing on Tuesday, the last date to enter the fray. According to the Election Commission’s website, of the total nominees, 244 are from the ruling Congress, 258 from the opposition Bharatiya Janata Party, 208 from the Janata Dal-Secular, 1,084 are Independents and 613 from regional parties and fringe outfits. As more than 224 candidates have filed from the Congress and BJP, their spokesmen told IANS that the additional 20 from the Congress and 34 from the BJP would have filed without the mandatory B-Form from their respective parties and hence were likely to be rejected after scrutiny on Wednesday or if they pullout by the last date of withdrawal on April 27. Nominations began on April 17 after a single-phase election to the 224-member assembly was notified. “Some of our party members would have filed nominations without the B form as rebels or will be contesting as Independents if they are rejected as official candidates during the scrutiny by the EC,” Congress spokesperson B.K. Chandrashekar told IANS here. BJP state spokesman S. Shantharam added that the party had given out only 224 mandatory B-Forms, one each to the nominated candidate from every constituency. The ruling Congress fielded 15 women, the BJP 16 and the JD-S 12. In addition, 56 women have filed as Independents from various constituencies across the state. Among those who filed nominations on the last date are Chief Minister Siddaramaiah and BJP’s Lok Sabha member B. Sreeramulu from Badami in Bagalkot district. Siddaramaiah has also filed nomination on April 20 from Chamundeshwari in Mysuru and Sreeramulu from Molakramuru (reserved/ST) from Chitradurga district. P. Ravikumar Ganiga of the Congress filed nomination from Mandya after the party’s sitting MLA and rebel star Ambareesh declined to contest though the party gave him the B-Form and tried to convince him in vain. Party’s state in-charge K.C. Venugopal later told the media here Ambareesh was not in fray for health issues but hoped he would campaign for the party, as he was one of the most popular leaders in the state. The BJP fielded T. Basavaraju from Varuna constituency in Mysuru on Tuesday after the party’s Chief Ministerial candidate B.S. Yeddyurappa said on Monday that his second son Vijayendra would not contest from the seat. Siddaramaiah has fielded his eldest son Yatheendra this time as the Congress candidate from Varuna.